Cobalt Strike 3.0 requires you to start a team server before you attempt to connect a client to it. 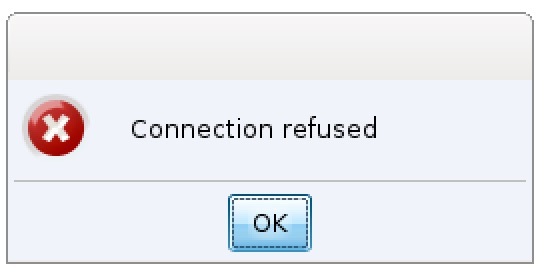 If you connect a client to 127.0.0.1 and no server is present, you will see the error: Connection Refused. 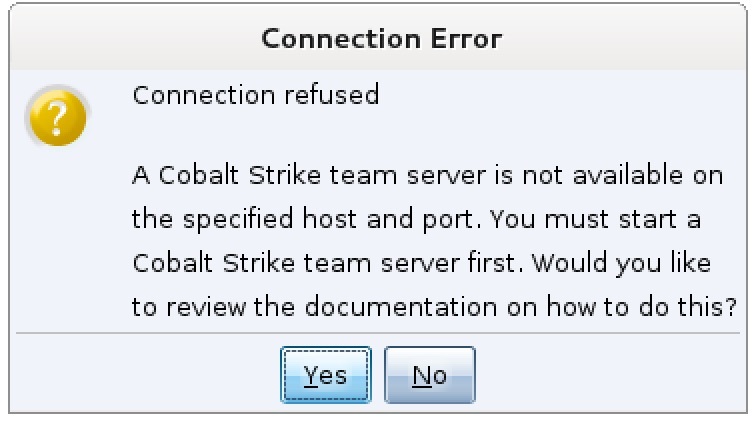 Cobalt Strike presents this error because there is no team server waiting to accept your connection. This behavior is a change from previous versions of Cobalt Strike. Previously, if you tried to connect to 127.0.0.1 and nothing was listening, Cobalt Strike would prompt you and ask if it should start a server for you. Cobalt Strike 3.1 will accompany the Connection Refused error with information describing the need for a team server and pointing users at the exact piece of documentation to look at. Beyond starting a team server, Cobalt Strike 3.0 is a significant change over Cobalt Strike’s predecessors [hence the 3.0 version]. I recommend spending some time with 3.0’s resources to understand these changes. The Advanced Threat Tactics course is a nine-part course on Red Team Operations and Adversary Simulations. All said, this course is nearly six hours of material! I released Advanced Threat Tactics with Cobalt Strike 3.0. I consider this material the go-to resource to become familiar with Cobalt Strike 3.0 and the process it supports. If you’re not too into videos, that’s cool. Give the Cobalt Strike 3.0 manual a read. This manual describes Cobalt Strike’s features in depth. It’s not the Great American Novel, but it’ll do. Finally, if you’re in a real hurry, keep the Cobalt Strike Support page open as you use the tool. This page has references for most Cobalt Strike features. At a minimum these references describe the feature and its use. Most of these reference pages have a short video demonstration too. Either way, this information is the best way to learn about what you’re immediately interested in. Whatever your learning style, there are resources to help you get up to speed with Cobalt Strike 3.0 and later.